If you are looking for dock lines that are strong yet will remain soft even after getting wet, Boatersland Discount Marine Supplies is the best shop for you. 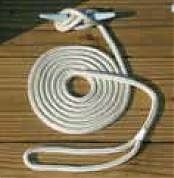 Boater Sports marine .5-inch double braided dock lines are made from premium quality, marine-stabilized high-tenacity nylon that resistant to a number of marine nuisances including: chafing, abrasion, oil, rot and mildew. These double braided lines are even finished with professional yacht whippings.